Sound it Out: Putumayo Kids, Recess Monkey, Hope Harris and The Dirty Sock Funtime Band! 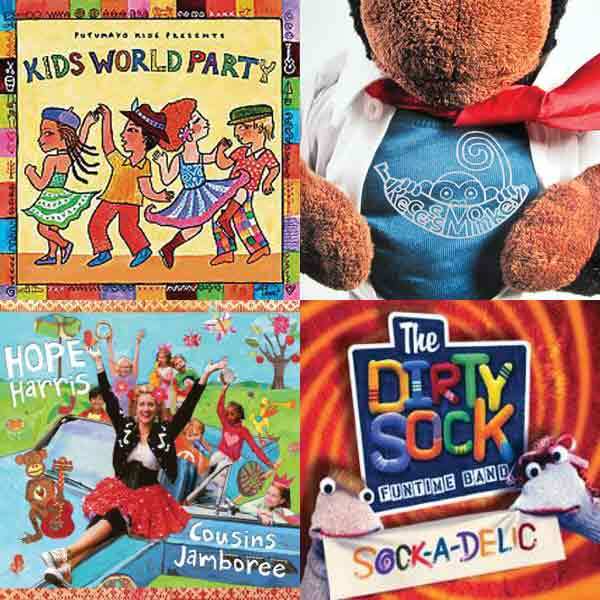 ♪ Compilation “Kids World Party” (Putumayo Kids) is a sonic trip around the world for all ages with everything from feel-good Indian pop (“Kitni Haseen Zindagi”) to dancehall (“Oompa Loompa”). Plus, fifty cents from each CD sale goes to Amnesty International! ♪ BLAM! KRRSSSHHHH! A soundtrack for lil’ superheroes? Yes, please. Recess Monkey’s “Flying” is a poppy rock album by a beloved trio of Seattle teachers who riff on everything from earning playground cred in the blues-rock “Sidekick” to a Ted Leo-esque ditty about stuffed toys with super powers (“Super Stuffies”). ♪ Yeehaw, ya’ll! It’s Hope Harris’ “Cousins Jamboree” takin’ you down home for some country fun. This southern belle kindly introduces herself in “Howdy Hello” and welcomes her lil’ listeners to the jamboree on the second track. It’s a fun record with ditties about critters, manners and friendship, plus a sleepy-time ballad toward the end for good measure. ♪ The Dirty Sock Funtime Band might make Gen Y parents nostalgic for Sifl and Olly at first glance, but these socks puppets are Rated G. “Sock-a-Delic” is a silly album that walks through a variety of topics and genres from a jingle about a thrift store for superheroes (“Ernesto’s”) to a spirited ode to random objects of adoration (“I Love It!”). “Sock-a-Delic” is a great companion to the live show experience.